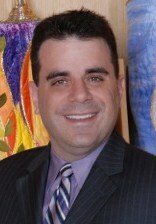 Rabbi Mark Kaiserman became the rabbi of Reform Temple of Forest Hills in July 2013 returning to his childhood New York City and becoming part of this dynamic synagogue community. During his rabbinic career, Rabbi Kaiserman has worked at all ends of the country. He served as the rabbi of Temple Emanu-El of West Essex in Livingston NJ, as assistant/associate rabbi of Temple Emanu-El in Dallas, Texas, and an Interim Rabbi at Congregation B’nai Tzedek in Fountain Valley, California. Originally from Brooklyn, New York, Rabbi Kaiserman received a B.A. in English Literature and Judaic Studies from Binghamton University. He earned his M.A. in Hebrew Letters in 1996 and his rabbinic ordination from the Hebrew Union College – Jewish Institute of Religion’s Cincinnati campus in 1997. Working with all ages, Rabbi Kaiserman has especially focused on connecting with youth in both formal and informal settings. He volunteers each summer at the URJ 6 Points Sci-Tech Academy. He has been honored with Youth Worker of the Month by RJYouthworker and for his work with NFTY’s Texas/Oklahoma Region and the URJ Greene Family Camp. With a childhood love for acting, he has co-written numerous popular Purim shpiels for all ages adapting the music from shows such as The Sound of Music, Grease, Fiddler on the Roof, Disney, and The Wizard of Oz. Interfaith work has been a concentration throughout Rabbi Kaiserman’s career serving on the Forest Hills Interfaith Clergy Association. He works regularly with social justice organizations to help us all make a better world. He also is an active volunteer in the Central Conference of American Rabbis and his alma mater, the Hebrew Union College, currently serving on the CCAR Ethics Committee and the HUC-JIR Rabbinical Alumni Association board. While in rabbinical school, Rabbi Kaiserman served as student rabbi in several small pulpits Texarkana, Texas, Victoria, Texas, and Quincy, Illinois. He is an amateur film buff and a diehard New York Mets fan no matter where they may be in the standings.